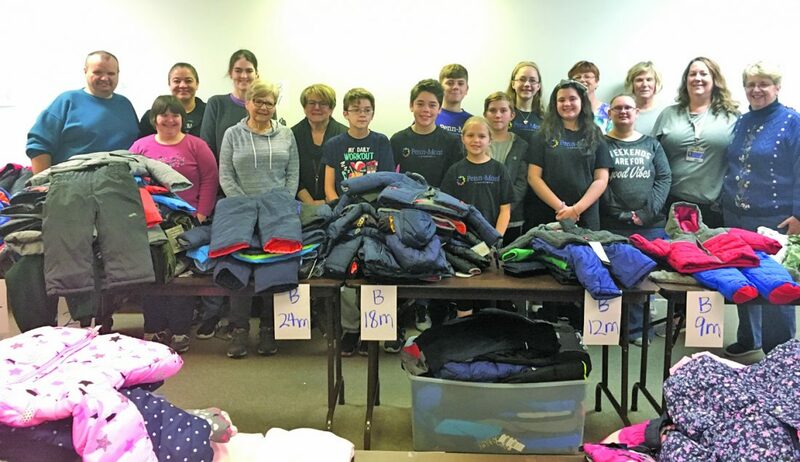 Courtesy photo Members and volunteers with The Family Resource Center and United Way are pictured with the winter coats and other clothing donated to help children in need. There have been 560 children assisted this year by the Toasty Toddler Program of the Family Resource Center at the United Way of Blair County. The Toasty Toddler Program originated several years ago with the Blair County Department of Social Services when they noticed a gap in winter programs for small children. For the past several years, the program has been implemented by the Family Resource Center at United Way, Blair County’s Family Center. Its focus is in on providing children birth through five years of age with warm winter outerwear including new coats, hats, gloves and scarves. Collection begins in September by area businesses, agencies, churches, schools, civic groups, and individuals. Referrals for outerwear are made by local agencies serving children in this age group beginning in October and by individual families calling and requesting help. An evening in early November is organized for volunteers to sort and pack the coats, hats and gloves for toddlers who have been referred. Coats and items continue to be collected throughout the winter season by those businesses and agencies that include Toasty Toddler giving in their end of the year festivities for employees and members. Individual needs continue to be filled by the Family Resource Center staff as additional referrals and donations arrive throughout the winter season. The need is always great as is the generosity of the community. “We greatly appreciate the generosity of the community, both individuals and organizations. This program is truly a great collaborative effort of Blair County and our organization is proud to coordinate this project addressing a need in the community,” Denise Adams, director of the Family Resource Center at the United Way of Blair County said. Each year, the Toasty Toddler Program has wonderful businesses, agencies, churches, schools, civic groups as well as many unnamed community members who volunteer their time as well as collecting and donating funds and winter outerwear. This year’s participants included donations and volunteers from: Advanced Chiropractic, Allegheny Lutheran Social Ministries, Alpha Assembly Solutions Charitable Giving Committee, Altoona Area Public Library, Altoona Family Physicians, Altoona Story League, Altoona Sunrise Rotary, Blair Regional Nurse Practitioners Association, Buccinese Women’s Auxillary, Central Blair Recreation Commission Employees, Crossroads, DelGrosso’s Employees, Faith United Church of Christ, Hite Company, Hollidaysburg Area Public Library, Home Nursing Agency, IQor, Kohl’s of Altoona, Lakemont Lions Club, Mary Queen of Angels Fraternity, Our Lady of Mount Carmel Church Family Life Committee, PA School Retirees Blair County Chapter, Penn Dot Engineering District 9-0, Penn Highlands Community College, Penn-Mont Academy, Penn-Mont at Penn State, Penn State Development and Alumni Office, Penn State University Lion Ambassadors, Re/Max Results Realty, Roaring Spring Community Library, Skills of Central PA, SkillsUSA of the Altoona Area High School, Smith Transport, St. James Lutheran WELCA, St. John the Evangelist Church Women’s Group, UPMC Altoona, Value Drug, Veeder Root, United Way of Blair County, Family Resource Center Advisory Committee Members. The Family Resource Center and United Way would like to thank all those, named and unnamed, who contributed to this year’s program.